First impression: Oh, yeah, I remember when everyone was doing Tae Bo. Second impression: Why are Billy Blanks’ hands all taped up if he isn’t actually going to punch anything? 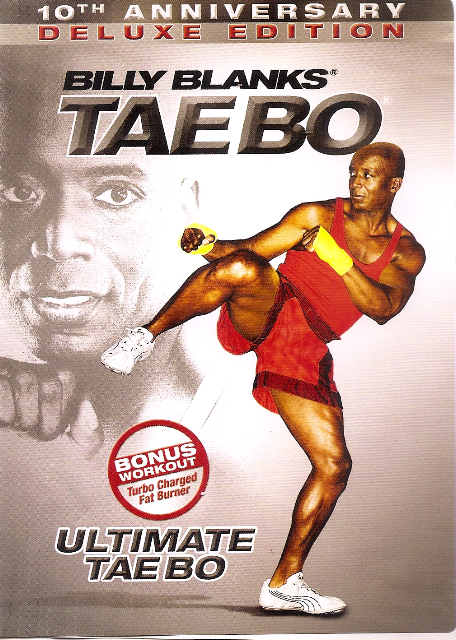 This DVD has an 89 minute Ultimate Tae Bo routine, which I haven’t done yet. I did the 23 minute Turbo Charged Fat Burner routine instead. There is also a short demo of Billy Blanks demonstrating each move, assisted by his stepdaughter Shellie. I appreciated the opportunity to practice the moves at half speed so I could figure out how to do them without kicking over my priceless Ming vase. This video is fun to do and I especially enjoyed pretending to punch annoying people while I was uppercutting and jabbing into the air. Forget meditation, this is the path to inner peace! Billy Blanks is backed by a squad of disciples who obey his orders with cult-like devotion. He really is a charismatic presence and his rhythmic chants of “Work it! Work it!” to the off-beat are practically hypnotic. I’m so glad Billy Blanks is using his powers for good instead of evil. The Turbo Charged Fat Burner Workout features intervals of the moves done at double speed, to get your heart rate going. I could do most of these okay, except for the ones where you’re supposed to rotate your torso back and forth in a rapid, whiplike motion that is sure to injure your low back, I mean, really sculpt your abs. The Fat Burner workout also features an optional piece of equipment, the Amplifier, which looks like a curtain rod. You hold it in both hands while you are pretending to punch people, and then you can pretend to smack them with a metal pipe also. Yes! At the end of the video, everyone gathered around for a Power Moment, where Billy Blanks made a speech about being truly blessed to come into my home and work out with me. I’ve stopped the DVD right before that part in subsequent workouts because, you’re welcome, Billy Blanks, and thank you for allowing me to punch and kick in a socially acceptable way. This entry was posted in Reviews and tagged cardio, Celebrity Host, fun, trendy, under 30 minutes. Bookmark the permalink.